Your hard work, dependability and success with your clients will not go unnoticed. The Home Instead Senior Care network recognizes exceptional CAREGiversSM with local and national CAREGiverSM of the Year awards in appreciation for all they do. 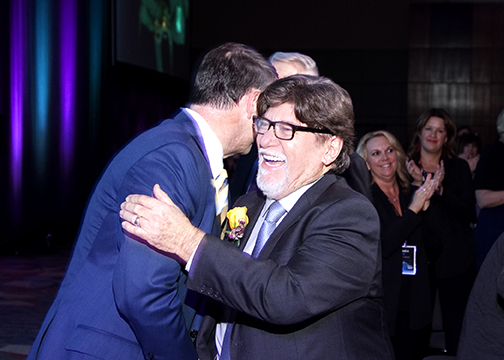 Last night, James Perez of Mission Viejo, California, was named the 2018 North American CAREGiverSM of the Year for his lifelong dedication to serving others. For more than 20 years, Home Instead Senior Care has selected one of its 70,000 North American professional caregivers for the prestigious annual award – identifying a CAREGiverSM who demonstrates extraordinary compassion and care toward his/her clients. The Home Instead Senior Care franchise network, the leading provider of home care services for older adults, employs more than 70,000 CAREGiversSM worldwide. Home Instead CAREGiversSM help individuals remain independent for as long as possible in the comfort of their own homes or in care communities as they age, providing companionship and services ranging from meal preparation and medication reminders, to personal care and Alzheimer's care. "CAREGiverSM of the Year is the highest accolade for a Home Instead CAREGiverSM," said Lori Hogan, co-founder of Home Instead Senior Care. "We are blessed to work with amazing CAREGiversSM like James Perez who truly live our mission of enhancing the lives of aging adults and their families." "James is one of a kind," said Sanders. "He is compassionate and incredibly caring. I believe there is no greater heart than that of a CAREGiverSM, and James is no exception. James demonstrates kind-heartedness countless times every day, allowing us to deliver the highest quality care to our clients." To learn about becoming a CAREGiverSM and joining the Home Instead family, visit www.homeinstead.com/jobs.